^ A Little Irish Cookbook. Appletree. 1986. ISBN 0-86281-166-X. 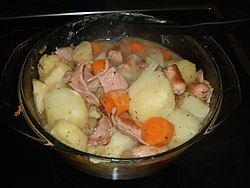 ^ A traditional Irish cold weather treat Dublin coddle recipe. 24 April 2017 [15 January 2018]. ^ From Bacon and Cabbage to Coddle: What is Ireland's national dish?. [15 January 2018]. ^ Veronica Jane O'Mara & Fionnuala O'Reilly. A Trifle, a Coddle, a Fry: An Irish Literary Cookbook. Wakefield: Moyer Bell. 1993. ISBN 1-55921-081-8.